With Actinox® you can utilize all nutrients for muscle growth (anabolic effect)! 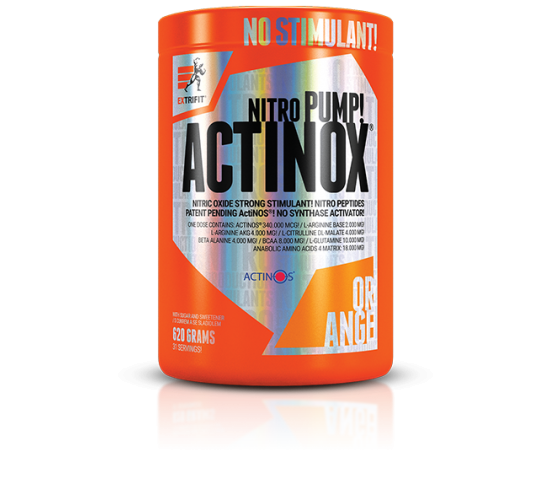 Actinox® is unique product for persons trying to increase really great muscle mass. The main ingredient of this product – patent pending ActiNOS® (selective nitro peptides and fractions of modified partly hydrolyzed whey isolate)– allows thanks to its effect on nitric oxide (NO) production the whole day long, increased blood flow. Actinox® contains also other NO stimulants: arginine (in the form of alpha-ketoglutarate andarginine base), beta alanine and citrulline. Thanks to extra doses of BCAA, glutamine and PalatinoseTM (isomaltulose) contained in Actinox® You can fill up Your muscles with everything what they need for maximum growth after hard training. ActiNOS® (known as CFM Nitro P too) are selective nitro peptides and fractions of modified partly hydrolyzed whey isolate. These nitro peptides increase long-time better flood flow and pumping of muscles through stimulation of nitric oxide synthetase enzyme production. The research on clinical field is focused on their effect on blood pressure lowering, immune system stimulation and sexual function in men improvement! Thanks to Actinox® You will be able to train as professional bodybuilders! Maximum effect on hardness of Your training! The oxygen gets faster into working muscles thanks to increased blood flow and the lactic acid is better flown out of the muscles – Actinox® allows You to do more repetitions in every next training! It postpones feeling of burning in muscles and their exhausting and You will be able to perform more in every set of Your training! Did You know that amino acids content (20 amino acids) in human muscle is made up of 33 % BCAA (valine, leucine a isoleucine) and 60 % of glutamine? We created an exclusive product for hard-working athletes that will supply Your muscles with extra doses of BCAA and L-glutamine the whole day long! You can use this product even on non-training days for better nutrient utilization in Your growing muscles thanks to increased blood flow to muscles because the most intensive muscle growth is going on during the sleep, not during the training! On training days use on the contrary NO products containing stimulants as Hell Gel®, Hellnox® or E.nox®! PalatinoseTM (isomaltulose) content reliably provides energy supply of Your muscles and their fast loading up with glycogene the whole day long. Does not contain any caffeine or other stimulants – You can fall asleep well! This product does not contain any stimulants that´s why Your muscles can be supplied by higher amount of blood the whole day long without any uncomfortable disturbance of sleep. It is revolution on the field of NO products – product working the whole day - Actinox®! Do You like feeling of pumped muscles after the training when sleeves of Your T-shirt are suddenly thigh? What about increased blood flow to muscles and great pump whole day long? Do You want to have Your muscles full of blood with pulsing veins on biceps as a pro bodybuilding competitor? Try our Actinox® and have Your muscles pumped up whole day long! Actinox® is intended for all athletes of all performance levels! See table on the back side of product´s label: beginners and slightly advanced – 1 scoop (1 scoop = 1 dose) in the morning on non-training day, advanced and bodybuilders – 1 scoop in the morning and 1 scoop in the afternonn on non-training day (40 g together).